MyBonBons is the line of customisable jewellery with Nomination charms in stainless steel and yellow and rose gold. The collection includes bracelets, necklaces, earrings and rings made of hypoallergenic stainless steel and embellished with disks containing precious symbols with many different meanings. Choose your favourites and express your personality through your jewellery: the MyBonBons collection includes charms with the letters of the alphabet and good luck symbols such as ladybugs, four-leaf clovers, horseshoes and many others. 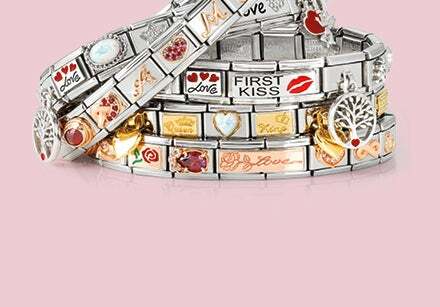 You’ll also find jewellery and charms decorated with sparkling Cubic Zirconia gemstones. In addition to pieces adorned with stainless steel and gold disks, you’ll find a large selection of MyBonBons charms you can use to create your personalised bracelet. For your base, choose either the long or short leather bracelet and add all the disks your heart desires, customising your jewellery just the way you want. The leather bracelet is available in many different colours: from the most classic, such as black, brown or white, to the brightest shades, such as green, pink, and blue. Many of the charms that adorn MyBonBons jewellery are decorated with Cubic Zirconia or Swarovski gemstones. You’ll find precious stainless steel necklaces with your initial engraved in rose gold and a small gemstone that shines brightly, but also charms for your personalisable bracelet decorated with symbols such as hearts or circles. Express your style in its every nuance: a bright detail adds a touch of grit to your look without taking away the class that only a precious jewel can give, on every occasion. Choose MyBonBons for yourself or for an original gift idea: you’ll find trendy, high quality jewellery that’s guaranteed by the Made in Italy seal. There are perfect jewels and symbols for every occasion. Choose your favourites based on your taste or, if it’s a gift, based on the occasion and your budget. 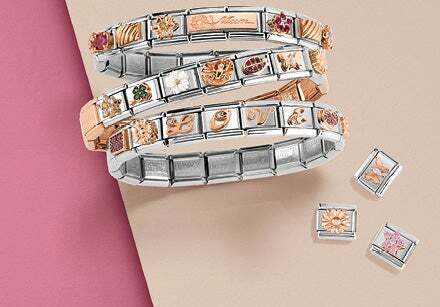 In fact, there are many options under €50: from coloured leather bracelets personalisable with charms, to many of the charms themselves you can add to each piece of jewellery. For yourself or for whoever you want, MyBonBons is a line of essential jewellery that allows you to express your personality, on every occasion.